We often hear that Switzerland lacks of a big startup event. Dublin had one with Web Summit (now moving to Lisbon), Paris had one with LeWeb (now kind of “replaced” by the The Rude Baguette events or the new Viva Technology event), Vienna has Pioneers, Münich has DLD Conference, Amsterdam has The Next Web, Barcelona has many startup events around the Mobile World Congress, Berlin and London have PLENTY (NOAH, etc.). And how about Switzerland? It is not the pompously named WorldWebSummit which can fill the gap. START Summit (happening on Friday in St. Gallen), alongside with the Swiss Startup Day and Startupfair are the biggest startup events in Switzerland. The three of them have different models and they do their best to attract renowned startup people from across the world (for Start Summit, leveraging the HSG St-Gallen alumnis network). But none of these events is really, IMHO, comparable to WebSummit, Pioneers or The Next Web. But… it was before… SeedStars World Summit! It happened early March in Lausanne (right on the famous engineering school EPFL), now organised independently from Lift Conference in Geneva. SeedStars World is a startup competition in emerging markets, started some years ago by Alisée de Tonnac, Michael Weber and Pierre-Alain Masson. 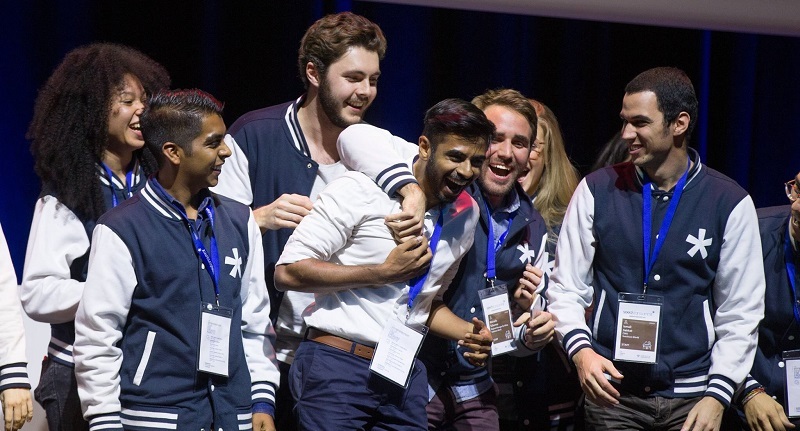 Travelling across more than 55 countries during the year, SeedStars is organizing national startup competitions and invite then each local winner in Switzerland for the Grand Final. After a first private investors day, where startups where pitching and getting feedbacks, a dozen entrepreneurs, the best of the best, were selected to pitch during the public event the following day… What a show! The less we can say, was that it was the American-style kind of pitching session, with good vibes and energy. And amazing entrepreneurs pitching their startup. I’ve been particularly impressed by two of the startups, Giraffe (a South African startup developing a recruitment solution to find quickly medium skilled workers) and asoriba (a Ghana-based startup developing a CRM for churches to manage their community). What energy and passion in Giraffe pitch! And the preach – sorry, the pitch! – of asoriba was just fabulous. That’s what we can call “breathing its startup”! Why is SeedStars World so interesting and promising for the Swiss Startup Scene? First, SeedStars brings 50+ of the best startups of emerging countries, bringing fresh ideas and often solving real life problems. Problems that we, in developed countries, have no way to discover from here. Secondly, it helps you to do a worldwide startup tour without moving far away. Maybe less attractive that back-packing and travelling across the world… but ways more efficient if you’re have a daily job. You can find amazing opportunity with these entrepreneurs (investement, business development deals, technology, etc.). Third, SeedStars World attracts every year more renowned people from the European startup scene, from investors to corporates executives to media. Which also gives a unique opportunity to Switzerland-based entrepreneurs to meet them! Fourth, SeedStars World is powered by entrepreneurs, for entrepreneurs. You see it, even with the “uniforms” of the organisation crew (not uniform, but baseball jackets, giving the impression you’re on an US campus!). The Swiss Tech Convention Center, where SeedStars World happened, is very big. So let’s find a way to transform this unique event in THE Swiss Startup event! GO FOR IT GUYS! And finally, a last picture of the event with the winner, Giraffe, which is taking home the Grand Prize of $500’000.- cash!